Our study starts with a series of quantum-mechanical (density-functional-based) studies of helium-mediated deposition of catalytic species on the rutile TiO2(110)-(1×1) surface. The interaction of helium with the TiO2(110)-(1×1) surface is first evaluated using the Perdew-Burke-Ernzerhof functional at a numerical grid dense enough to build an analytical three-dimensional potential energy surface. Three (two prototype) potential models for the He-surface interaction in helium scattering calculations are analyzed to build the analytical potential energy surface: (1) the hard-corrugated-wall potential model; (2) the corrugated-Morse potential model; and (3) the three-dimensional Morse potential model. Different model potentials are then used to study the dynamics upon collision of a 4He300 cluster with the TiO2(110) surface at zero temperature within the framework of a time-dependent density-functional approach for the quantum fluid [D. Mateo, D. Jin, M. Barranco, and M. Pi, J. Chem. Phys. 134, 044507 (2011)] and classical dynamics calculations. The laterally averaged density functional theory-based potential with an added long-range dispersion interaction term is further applied. 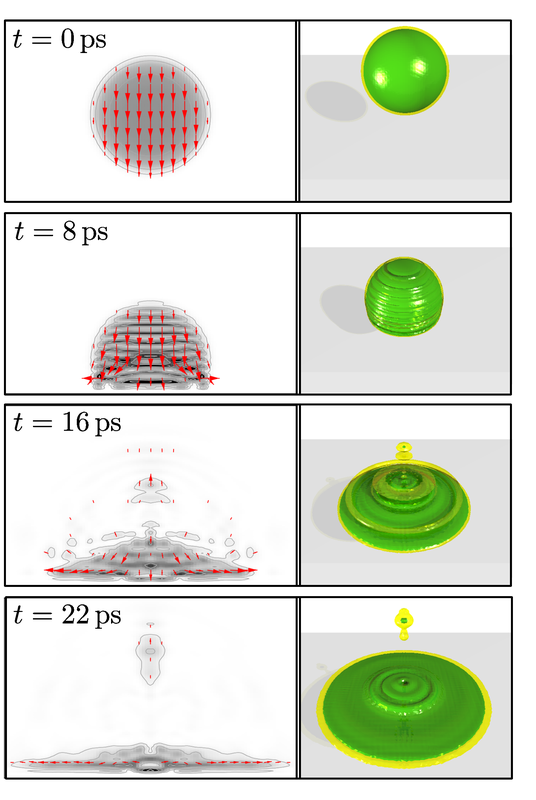 At variance with classical dynamics calculations, showing helium droplet splashing out of the surface at impact, the time evolution of the macroscopic helium wave-function predicts that the helium droplet spreads on the rutile surface and leads to the formation of a thin film above the substrate. This work thus provides a basis for simulating helium mediated deposition of metallic clusters embedded within helium nanodroplets. The Journal of Chemical Physics, 2012, 136, 124703/1-14. Selected for the April 9, 2012 issue of Virtual Journal of Nanoscale Science & Technology (Surface and Interface properties).